PUTNAM COUNTY, Fla., March 5, 2018 /PRNewswire/ -- The team at the Vulcan Materials Company (NYSE: VMC) Grandin Sand Plant has earned Wildlife Habitat Council (WHC) Conservation Certification for its commitment to managing a 14.4-acre on-site rookery. Vulcan partnered with the Santa Fe Audubon Society to identify and inventory the birds that utilize the rookery. To date, 85 species of birds have been identified with more than 3,500 birds using the rookery during peak season. The rookery is a unique avian habitat in Florida and is located adjacent to an active construction aggregates operation. "The Grandin Sand Plant is recognized as meeting the strict requirements of WHC Conservation Certification," said Margaret O'Gorman, President, WHC. "Companies achieving WHC Conservation Certification, like Vulcan, are environmental leaders, voluntarily managing their lands to support sustainable ecosystems and the communities that surround them." The Grandin Sand Plant is one of 44 WHC-certified Vulcan sites across the country. "Being good environmental stewards means conducting operations in a way that ensures air, water and wildlife are protected today and for future generations," said Traci Johns, a Vulcan environmental specialist. "This is a great example of partnership between mining and a highly reputable citizen science group working together to achieve common goals for environmental conservation." The rookery is developed in a former sand mining pit on Vulcan's site. In 2004, sand mining operations ceased in the area specific to the rookery. Vulcan is committed to preserving and protecting the rookery and is working to establish formal protections through additional coordination with government agencies. "It is incredibly exciting to observe 2,000 spectacular birds land in front of us at such a unique site," said Laura Berkelman, President of Santa Fe Audubon Society, Inc. "More importantly for us is the contribution we can make to this rare refuge and breeding site. These sites are vital for the resiliency and sustainability of the remaining populations of uncommon and threatened birds. We are proud to partner with Vulcan to help this conservation project and, indirectly, the $2.7 billion wildlife-viewing industry and 44,000 jobs for our fellow Floridians while helping the birds we love. It's gratifying to see Vulcan's appreciation for this site." Vulcan's Grandin Sand Plant provides construction aggregates that form the building blocks for Northeast Florida's roads, bridges, homes and more. 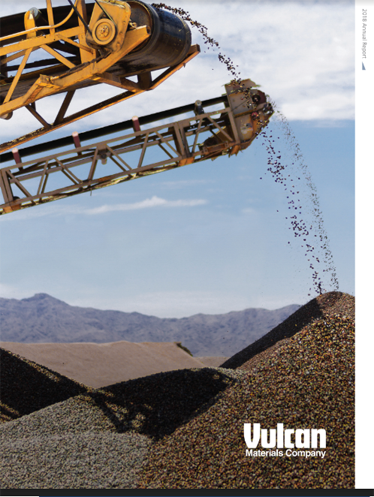 Vulcan Materials Company is the nation's largest producer of construction aggregates and a major producer of aggregates-based construction materials. An industry leader in safety, health, and environmental stewardship, Vulcan's coast-to-coast footprint aligns with and serves the nation's growth centers. Through the company's extensive logistics network, Vulcan provides materials to build and repair valuable infrastructure such as roads, bridges, residential and commercial buildings, schools, hospitals and places of worship. Learn more at csr.vulcanmaterials.com.